Name history Fatu (debut - ?? ), Headshrinker Fatu (WWF, early 1990's), The Sultan (WWF, mid-1990's), J.R. 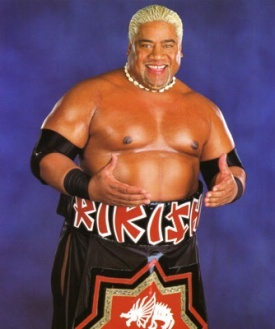 Smooth (Memphis Power Pro Wrestling), Rikishi Fatu/Rikishi Phatu (1999 - 2004), Kishi (2004 - ), Junior Fatu (TNA - 2006). In Mexico, first appeared as a foreigner for the UWA in the early 90s. Has worked on occasion for AAA, including 2007's TripleMania. This page was last edited on 24 June 2012, at 10:54.